It's an acid test against the Czech Republic in the World Group Play-off tie, but Rohan Bopanna is confident India’s Davis Cup team can tame the world number one three-time champions. Addressing the media ahead of the September 18-20 tie, at the R K Khanna tennis stadium in Delhi, Bopanna spoke with the confidence that’s come following a consistent showing on the ATP Tour where he remains a contender to win big tournaments including Grand Slams. "We have done it in past. Rankings don't matter (Czechs have two top-100 players). Then there is heat, so it depends on which player controls all of it better. We have a great shot at getting back into the World Group," said Bopanna, who has come out of the shadows of veterans Leander Paes and Mahesh Bhupathi in the last two-three years. 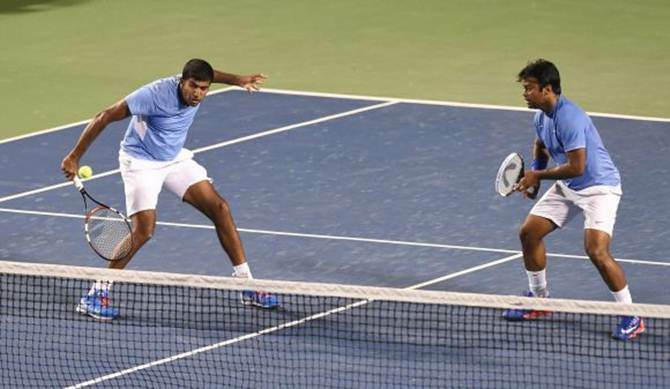 Bopanna and Paes had pulled off a tough match against world number two Serbia, exactly a year back in Bangalore, and he believes that an encore is possible this time around. He, however, cautioned that irrespective of the Czechs’ team combination, India has a tough job on hand. is Lukas (Rosol) or (Jiri) Vesely or the other guy (Adam Pavlasek). It's an experienced team. They are not only in the World Group for such a long time but have also won it twice. We have to play our best tennis," he said. India's non-playing captain, Anand Amritraj, said the absence of world number six Tomas Berdych has increased India's chances, plus the searing Delhi heat may make it tough for the visitors. "With Berdych it would have been out of our reach, but now I think we have a much better chance. Having said that they have a guy in the top-50 one on top-100, and Stepanek is there; it is going to be tough. "Heat is definitely going to be a big factor; it is going to be 37, 38 (degrees) in the afternoon. However fit you are, to concentrate for three sets mentally and physically won't be easy," he said. The captain also said the pressure to win will be more on the Czechs since they are favourites. Yuki Bhambri, who will be India's number one singles player in the tie, said he is in good touch and looking forward to take advantage of the home conditions. He is coming into the tie after winning a Challenger title in Shanghai. "When you are winning it means you are playing well. But we have to put forward out best foot. We are not favourites here but playing at home makes a difference. I have grown up here, Somdev also plays well here. Looking to take advantage of that," the 23-year-old said. Bopanna was at his witty best while answering a few questions as the gathering burst into laughter, at least thrice. Asked if he had spoken to either Sania Mirza or Leander Paes about playing in the Rio Olympic Games, he shot back: "It's up to Sania to decide. She is playing the tennis of her life. She has to decide with whom she wants to play. I want to play with her, Leander also wants to play with her. "About the men's doubles, do we have any other option (than Leander and him)? If I am not mistaken, we need a combined ranking of 60-65 and no other (player) can make it (other than us). Even if we try to make a combination, we can't do it," he said.